Ever order a kale salad and discover a neckbone in it? That's funk. Ever written a love letter on a chicken grease-stained napkin? That's funk. 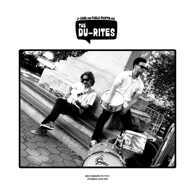 The Du-Rites are without a doubt the soundtrack to both of those situations, but by definition, The Du-Rites are a duo of New Yorkbased multi-instrumentalists comprised of Pablo Martin (guitar, bass, synthesizer) and J-Zone (drums, organ, bass, turntables, percussion instruments that require little skill). With influences ranging from the obvious (Booker T. & The MGs, Lalo Schifrin, Cameo, Kool and the Gang, The Meters, Jimi Hendrix, P-Funk, Motown, Herbie Hancock, and James Brown) to the obscure (overlooked late '60s funk bands Warm Excursion, TSU Toronadoes, and Willie & The Mighty Magnificents), The Du-Rites manage to bounce from improvisational, raggedy and psychedelic to tight and snappy with the skip of a track. Pablo's proficiency in punk, disco, pop and Latin and J-Zone's deep roots in hip-hop and jazz-funk combine to make one of the more off-kilter, but undeniably funky instrumental long players you'll dig into.